he Elizabethan period saw a move away from family-oriented business activities towards partnerships of merchants and speculators which extended beyond any single mercantile venture or voyage. To sustain such arrangements, the partnerships needed to be formalized as what later came to be known as joint-stock companies. When in 1553 an expedition seeking a northeast passage to Cathay instead established trading relations with Moscow, various London merchants formed the Muscovy Company to exploit Anglo-Russian trade and continue the search for a passage through to Asia. A royal charter granted the company a monopoly. It was therefore to the Muscovy Company that Frobisher, in December 1574, applied for a licence and financial backing to seek a northwest passage to the Far East. The Company was skeptical and at first refused a licence. However, its London agent, Michael Lok, was already in favour and convinced some fellow members - perhaps dissatisfied with the poor profits from the trade with Russia and the Company's suspension of the search for a northeast passage - to his way of thinking. Their influence, combined with pressure from the Privy Council, persuaded the Company to reverse its decision. 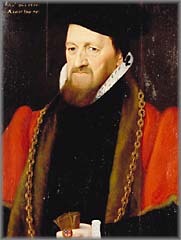 Lok's supporters within the Company included one of its governors, Sir Lionel Duckett, who was also a member of the Mercers' Company and Governor of the Company of Mines Royal as well as a former Lord Mayor of London; it was Duckett who arranged for John Dee to tutor Frobisher and his principal officers in the nautical sciences. They also included Stephen Borough, who had sailed on the 1553 expedition and in 1556 had made his own attempt to find a northeast passage; his brother and fellow-navigator William recruited seamen for the Frobisher voyages and later joined the investors. More important was the support of Muscovy Company member William, Lord Burghley, for he was lord treasurer of England, the Queen's chief advisor, and a leading member of the Privy Council. 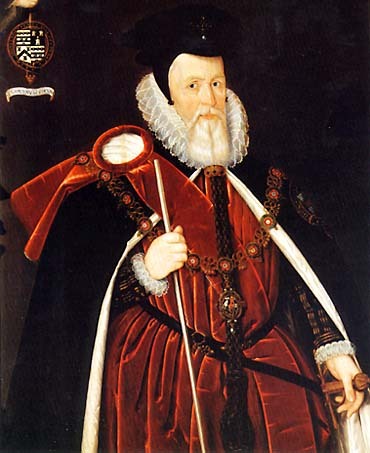 It was Burghley (who had employed Frobisher on state business in the past, and was already a supporter of the proposed voyage) who would steer the direction of the Frobisher expeditions, on behalf of the interests of Queen and Council. His commitment to the northwest venture led others of the Privy Council to invest. Lok used his membership of the Mercer's Company to attract additional investors from that quarter. These were among London's leading men of commercial affairs: men such as financier Sir Thomas Gresham, who had been a business partner with the Lok family in the past, and was wealthy enough to risk investing in a speculative venture such as was being proposed. 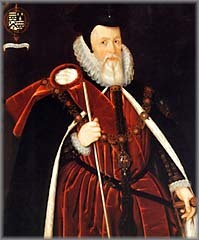 Gresham appreciated the need to develop the foundations of English trade; his legacy included the financial centre, the Royal Exchange, and Gresham College whose courses included navigation. Merchants of lesser wealth showed less interest in gambling on Frobisher's voyages. Emulating the example of the Muscovy Company, Lok and his fellow investors aimed at creating their own company - the Cathay Company - which would have a similar monopoly over trade and exploration in northwestern waters. It was important to obtain legal recognition of the investors' interests and rights, via a royal charter incorporating the company. Lok put forward repeated petitions to that end, proposing himself as the company's governor, but they appear to have been ignored by the Queen. The problem was that, while Burghley insisted upon some structured arrangement for organizing and funding the voyages, after the apparent success of the first voyage and even more once it appeared that a source of gold had been discovered, Queen Elizabeth herself invested, and many of her courtiers followed suit. An incorporated company would have limited the Queen's control over the aims of the expeditions and the resulting gold supply, and limited her share of the profits; so she withheld charter rights. Instead she appointed a royal commission to oversee the organization of further voyages. What had begun as a private enterprise had taken on characteristics of a public one. The Cathay Company consequently never acquired any legal status, and the original investors from the Muscovy and Mercers' Companies had little say over the direction in which the venture developed. Yet they were compelled by the royal commission to increase their investments as the third expedition, driven by political ambitions in terms of establishing a colony to protect England's interests in Meta Incognita, assumed a massive scale. The need for money was compounded by the fact that certain shrewd investors - including Burghley and Gresham - had not yet paid up most of the sums they had promised. With the collapse of hopes, once it was finally determined the Arctic ore was worthless, the scene was set for investors and creditors to try to recoup their losses. In the absence of any legal recognition of the "Company of Cathay", it was Michael Lok who became the principal target for recriminations and lawsuits.